Fall in Squamish is a time of unparalleled beauty. The mixed forests of deciduous and coniferous trees come alive with strokes of red, yellow, orange and green. From a high vantage, you can see the teal blue waters of Howe Sound and the freshly snow-capped peaks of the alpine. The whole scene is a patchwork of colours few visitors are lucky enough to see. If you are among the most fortunate, you may even see the first dusting of snow brightening up the entire landscape. Stand above Squamish for a breathtaking panorama of the Sea to Sky. From the summit deck, watch the whole of the valley come alive with colours. Dare to look down on the Sky Pilot suspension bridge and watch as the wind sends crimson red leaves dancing at your feet. The numerous walks above the gondola will take you through the trees to get an up-close look at the beauty of fall. The colourful mix of trees in Shannon Falls Provincial Park makes each season an entirely new sight to behold. While summer is lush and full of green, fall gives way to an amber oasis of deciduous trees ready to drop their leaves for the winter. The outflow of the falls only adds to the excitement, keep an eye out for leaves coating the boulders and floating delicately downstream. 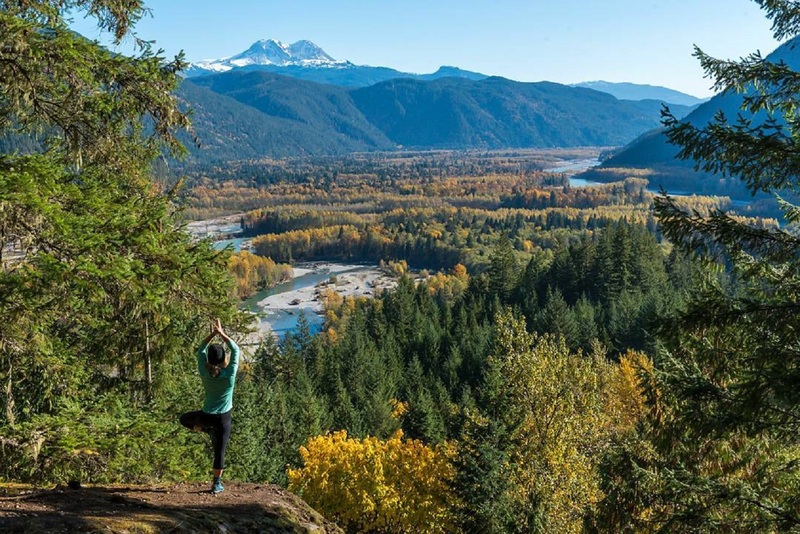 Go for a picnic in the Squamish Estuary, and bring your binoculars! Home to numerous species of birds you are practically guaranteed to see wildlife mulling about on the branches of nearby trees. Pack your tuques and your camera before making your way up the Stawamus Chief. Throughout the trail feast your eyes on forest views from underneath the canopy. From the top take a breath of the crisp fall air, don your tuque and stay awhile drinking in the unobstructed views. To reach this trailhead take the Squamish Valley Forest Service Road all the way to Ashlu road where you will cross left over a large bridge. After around 2km park your car in front of a small bridge. Cross the bridge by foot; the trail begins next to an electric pole on the lefthand side of the road. Follows the Sigurd trail (well marked) up a steep rocky section before heading left into the forest. Watch for a clearing and rocky bluff on your left 15-30 minutes into the trail; once you reach the viewpoint, you may continue to Crooked Falls (6km return) or turn around and head back to your car. Take the Valley Drive exit next to Chances Casino and park your car along the side of the road on the gravel parking area. A few hundred metres from the highway watch for a pedestrian bridge on the right side of the road. Enter the trail network here and walk along the Stawamus Dike. The colours along the length of the dike are stunning, and there are many offshoots to walk closer to the river and explore the area. Be extra cautious of water levels, falling leaves have a habit of making river rocks extra slippery! Home to over 200km of singletrack, most of which is surrounded by stunning Squamish forests, mountain bikers can ride through the changing seasons in as little as one ride. Popular fall trails include Wonderland, Pseudo-Tsuga and the entire Valleycliffe area. Panorama Ridge is a popular summer trail, but on a good day with no precipitation in the forecast, it is also a terrific fall hike. Fall is a short season in the alpine, lasting until the end of October at the latest, but on a lucky day, the views and crisp air of fall will blow your mind. Make sure to pack extra layers, a headlamp and have a firm turnaround time. Shorter, colder days are less forgiving than in summer. Autumn excursions to Elfin Lakes are met with unparalleled beauty. The views from the lake looking toward the Gargoyles reveal a stretch of golden meadow that comes aglow at sunset. You may see sun, rain or even snow all in one day. It is not uncommon for snow to fall as early as September in Garibaldi Provincial Park.